Dishfunctional Designs: A bird doesn't sing because it has an answer. 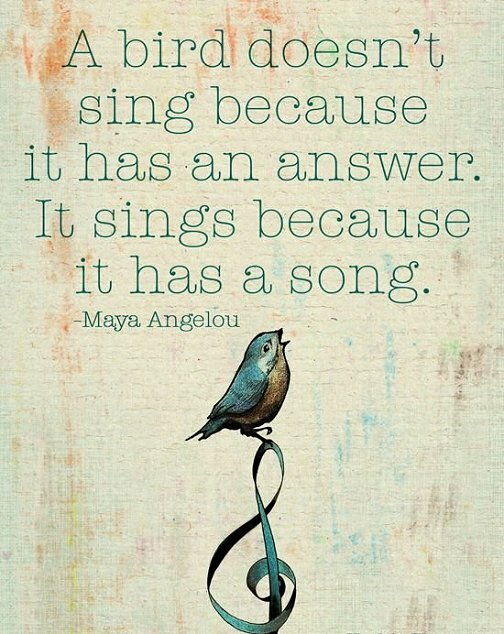 It sings because it has a song. A bird sings for both reasons. When we are frazzled by our collective hectic pace, when the worls seems just too much, when the noise inside our heads drowns our own voices...the bird sweetly sings. We are caught by her song and transfixed by its melody, its simplicity, sweetness and innocence and soon the song becomes the only sound in our head and we are mesmerized. Everything stops except for her song. She had a song to sing and so she did. In that moment her song became our balm to soothe our worn out souls. Her song was our answer.